Every year we find ourselves asking: Who is going to show? Who has calved since Expo? Who has improved over the past three months? Never before have these questions been more relevant. Different judge, different day will be two magic themes in this year’s competition. Yes we know there are cows we will miss. And yes we know there are cows on the list that may not be at the show. We here at the Bullvine have done our best in trying to handicap each class. We have taken some cows off of the list that we have confirmed are not attending. But with so many top cows not hitting the shows already this season, it’s hard to tell who will be there and who will not. If you feel that we have underscored a cow (meaning too low a dollar value in relation to the other cows in the class), that is all the more reason to have this “great buy” in your string. 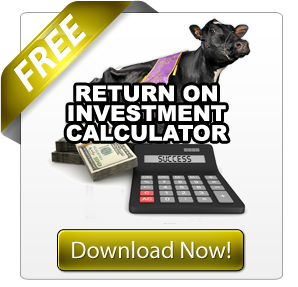 Remember that you have a limited number of dollars to spend, so you are as much looking for the cows that offer the greatest value as you are trying to predict who will win the class. The entry deadline will be noon Thursday, November 8th. There will also be a 10 point bonus for each day you submit your entries prior to that. For example, if you submitted your “string” on November 5th you would receive a 30 point bonus. Also, make sure that you don’t spend more than $1,000,000 as any exhibitor string that spends more than $1,000,000 will be removed from the competition. Winners will be announced on Tuesday, November 13th, 2017. The grand prize winner receives a one-of- a-kind Bullvine Fantasy Exhibitor Champion Jacket. All ties will be broken by date of entry. If submitted on the same day, ties will be broken by total dollars spent. In what continues to be one of the most anticipated competitions on the tanbark trail, the 2018 Royal Winter Fair Fantasy Exhibitor contest did not disappoint. Topping this year’s competition, was Ethan McMillan of Kingsway farms. Well known for their ability to breed great show cows, Ethan is also one of the best at identifying great value picks a skill that served him well when he selected MISS OCD DOORM GEORGETTE, GARAY DOORMAN BLIND DATE, OAKFIELD BLAKE LUXURIANT, GLENNHOLME MARIO MERCILESS, RONBETH DOORMAN SULTANA, GARAY AWESOME BEAUTY, FLORBIL DOORMAN LILLY, VINBERT KINGBOY BIRDY, KINGSWAY GOLDWYN LAUREN, IDEE WINDBROOK LYNZI, CO-VALE DEMPSY DINA 4270 and JACOBS LAUTHORITY LOANA to earn 174 points, plus 70 points in bonus for early entry giving him a grand total 244 points. The ultimate team would have been MISS OCD DOORM GEORGETTE, ALL-GLO OKOOL TULLY, JM VALLEY DEMPSEY LYZARA, GLENNHOLME MARIO MERCILESS, JM VALLEY ATWOOD ALY, MIDAS TOUCH JEDI JANGLE, FLORBIL DOORMAN LILLY, ALZFINCH ZELGODIS TACI, MAPLELEY GOLDWYN JULIA, JACOBS WINDBROOK AIMO, JEANLU STANLEYCUP ALEXIS and JACOBS LAUTHORITY LOANA, would have been a total budget of $926,000 and would have earned 248 points before bonuses. Let’s face it, everyone thinks they could be the next World Dairy Expo judge or be the next premiere exhibitor if they had the money. Well, Fantasy Exhibitor© separates the talkers from those who are the real deal. It shows who is talking smack versus who has the talent to pick the winners and do it on a budget. Stop being a pretender, get your team in, and back up all the talk you have been spreading. Yes we know there are cows we will miss. And yes we know there are cows on the list that may not be at the show. We here at the Bullvine have done our best in trying to handicap each class. Does that mean all animals on the list will be exhibited, No, because we want to separate the pretenders from those that really know the bottom line we have intentionally left some animals on that may not be attending. If you feel that we have underscored a cow (meaning too low a dollar value in relation to the other cows in the class), that is all the more reason to have this “great buy” in your string. Remember that you have a limited number of dollars to spend, so you are as much looking for the cows that offer the greatest value as you are trying to predict who will win the class. The entry deadline will be midnight Thursday October 4th. There will also be a 4 point bonus for each day you submit your entries prior to that. For example, if you submitted your “string” on September 27th you would receive a 28 point bonus. Also make sure that you don’t spend more than $1,000,000 as any exhibitor string that spends more than $1,000,000 will be removed from the competition. We here at the Bullvine appreciate your support and enjoy bringing you fun competitions such as this. This is your chance to show the world your ability to pick the winners and to do it on a budget. Anyone can pick out a favorite in each class and then say that they are the best judge of cattle, but can they pick a great show string? And do it on a budget? As many in the past, putting it all together is a lot harder than you think. Best of luck and good picking! Just two points separated the top two competitors in this year’s Fantasy Exhibitor contest with Tim Seipt of Pennsylvania edging out Grant Vosters from Wisconsin. Tim got his entries in one day earlier than Grant and earned 4 extra bonus points that moved him past Grant for the win. Tim’s selections where KEYSTONE SOLOMON ALLSTAR, SAVAGE-LEIGH LALAS, OAKFIELD BLAKE LUXURIANT, CACHE-VALLEY SHOT DIMPLE, BUDJON-ABBOTT ALEXANDRA, RYAN-CREST HNOTIC ELISHA, FRAELAND DOORMAN BONNIE, MS SMITH OAK PW D MAGGIE, ERBACRES SNAPPLE SHAKIRA, MS GOLDWYN SATURDAY, JACOBS WINDBROOK AIMO, CO-VALE DEMPSEY DINA 4270 and LOYALYN GOLDWYN JUNE for a total spend of $991,500 ($1,000,000 budget) earning 178 points plus 28 points for getting his entries in on the first day of the competition. The ultimate team would have been MISS OCD DOORM GEORGETTE, GARAY DOORMAN BLIND DATE, MILKSOURCE TAELYN, AHD DOORMAN SILK, ROBJO DOORMAN EMBRACE, RYAN-CREST HNOTIC ELISHA, JUNIPER SID CHARDONNAY, MS BEAUTYS BLACK VELVET, ERBACRES SNAPPLE SHAKIRA, MS GOLDWYN SATURDAY, JACOBS WINDBROOK AIMO, CO-VALE DEMPSEY DINA 4270 and JACOBS LAUTHORITY LOANA that would have had a budget of $880,500 and would have earned 250 points before bonuses. Every year we find ourselves asking: Who is going to show? Who has calved since Expo? Who has improved over the past three months? Never before have these questions been more relevant. Different judge, different day will be two magic themes in this years competition. The entry deadline will be noon Thursday November 9th. There will also be a 10 point bonus for each day you submit your entries prior to that. For example, if you submitted your “string” on November 6th you would receive a 30 point bonus. Also make sure that you don’t spend more than $1,000,000 as any exhibitor string that spends more than $1,000,000 will be removed from the competition. Winners will be announced on Tuesday, November 14th, 2017. It was certainly a big week for Jared Dueppengiesser, not only did he exhibit the Grand Champion, but he is also our 2017 Royal Winter Fair Fantasy Exhibitor Winner. While it’s no Surprise he had CO-VALE DEMPSEY DINA 4270 on his team, other members include PETITCLERC SOLOMON ANNICE, JM VALLEY ATWOOD ALY, MILKSOURCE GLDNDRM ASSET, PETITCLERC ATWOOD SPOUTNIK, UNIQUE GOLDEN RING, ROSEDALE CATCH A GLIMPSE, ERBACRES SNAPPLE SHAKIRA, ARETHUSA DARYL SIENNA, IDEE WINDBROOK LYNZI, JACOBS WINDBROOK AIMO, TK-PLAIN-VIEW RIPLEY & ROSIERS BLEXY GOLDWYN with a total budget of $986,000 and earning him 244 plus 30 bonus points for getting his entry in early. The ultimate team would have been FLEURY DOUGLAS LISALY, BONNIE BRAE APE QUINN, LELLAVAN, AVALANCHE FUJI, FARAWAY DOORMAN MISSY, JM VALLEY DOORMAN LEXIE, BROWNTOWN MARIO MARLO, ERBACRES SNAPPLE SHAKIRA, ARETHUSA DARYL SIENNA, IDEE WINDBROOK LYNZI, JACOBS WINDBROOK AIMO, CO-VALE DEMPSY DINA 4270, TK-PLAIN-VIEW RIPLEY & JACOBS GOLDWYN LISAMAREE. That team would have cost $941,000 and would earn 262 points with no bonus points. Fantasy Exhibitor© is back and better than ever. Let’s face it, everyone thinks they could be the next World Dairy Expo judge or be the next premiere exhibitor if they had the money. Well, Fantasy Exhibitor© separates the talkers from those who are the real deal. It shows who is talking smack versus who has the talent to pick the winners and do it on a budget. Stop being a pretender, get your team in, and back up all the talk you have been spreading. The entry deadline will be midnight Thursday October 5th. There will also be a 4 point bonus for each day you submit your entries prior to that. For example, if you submitted your “string” on September 27th you would receive a 32 point bonus. Also make sure that you don’t spend more than $1,500,000 as any exhibitor string that spends more than $1,500,000 will be removed from the competition. Winners will be announced on Tuesday, October 10th, 2016. The winner of the 2017 World Dairy Expo Fantasy Exhibitor Contest is Scott Forsyth, with a team of CO VISTA DOORMAN 2417, TY D DEMPSEY LOVEMMY, LELLAVAN AVALANCHE FUGI, JACOBS HIGH OCTAINE LA LIANN, CAMPBELL-RUN GCHIP AMELIA, MILKSOURCE DOORMAN CHEX, CAMPHOLS DOORMAN ELISEE, UNIQUE DEMPSEY CHEERS, WEEKSDALE ABSOLUT VODKA, TREFLE CHASSEP DOORMAN, SKYCREST MINCIO PRICKLES, CO-VALE DEMPSY DINA 4270, JACOBS SID BEAUTY, ROSIERS BLEXY GOLDWYN earning him a total of 155 points, plus he submitted on the first day, so he received 52 bonus points. The ultimate team would have been MILKSOURCE GLDNDRM ASSET, CAMPBELL-RUN GCHIP AMELIA. CO-VALE DEMPSY DINA 4270, SMITH-OAK AVLNCH ROSETTE, RAN-CAN ALANZO CLICHE, ROSIERS BLEXY GOLDWYN, TK-PLAIN VIEW RIPLEY, PETITCLERC ATWOOD SPOUTNIK, TREFLE CHASSEP DOORMAN, ALEAH MILLEN NAUGHTY SURPRISE, BROWNTOWN MARIO MARLO, UNIQUE DEMPSEY CHEERS, SKYCREST MINCIO PRICKLES & ARETHUSA DARYL SIENNA that would have cost $1,469,000 and earned 252 points. Who is going to show? Who has calved since Expo? Who has improved over the past three months? These are the magic questions for the 2016 Royal Winter Fair edition of the Fantasy Exhibitor. As an added bonus we have now added twice as many animals in each class. The entry deadline will be noon Thursday November 10th. There will also be a 10 point bonus for each day you submit your entries prior to that. For example, if you submitted your “string” on November 7th you would receive a 30 point bonus. Also make sure that you don’t spend more than $1,750,000 as any exhibitor string that spends more than $1,750,000 will be removed from the competition. Winners will be announced on Tuesday November 15th, 2015. We here at the Bullvine appreciate your support and enjoy bringing you fun competitions such as this. This is your chance to show the world your ability to pick the winners and to do it on a budget. Anyone can pick out a favorite in each class and then say that they are the best judge of cattle, but can they pick a great show string? And do it on a budget? As many found in the inaugural competition, putting it all together is a lot harder than you think. Best of luck and good picking! Fantasy Exhibitor© is back and better than ever. Let’s face it everyone thinks they could be the next World Dairy Expo judge or be the next premiere exhibitor if they had the money, well Fantasy Exhibitor© separates the talkers from those that are the real deal. It shows who is talking smack and who has the talent to pick the winners and do it on a budget. Stop being a pretender and get your team in and back up all the talk you have been spreading. The entry deadline will be midnight Thursday October 6th. There will also be a 4 point bonus for each day you submit your entries prior to that. For example, if you submitted your “string” on September 27th you would receive a 36 point bonus. Also make sure that you don’t spend more than $1,250,000 as any exhibitor string that spends more than $1,250,000 will be removed from the competition. Winners will be announced on Monday October 10th, 2016. The results are in and the winner of the World Dairy Expo 2016 Fantasy Exhibitor contest is Jim Adams. 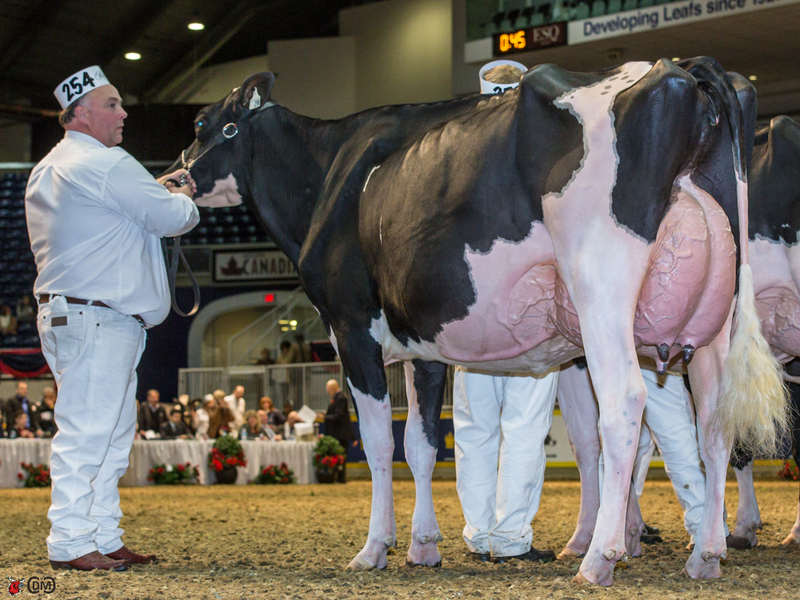 His team consisted of CANCO DOORMAN MAIMA, HIILLPINE B ANYA, COMESTAR LAMADONA DOORMAN, WINTERBAY DUDE GUINNESS, TK-PLAIN-VIEW RIPLEY, WEEKSDALE JUDGES HARMONY and LOVHILL GOLDWYN KATRYSHA. Jim achieved 105 points out of a max possible of 116. The ultimate team that would have been, CANCO DOORMAN MAXIMA, LEACHLAND ATWOOD MEGABYTE, COMESTAR LAMADONA DOORMAN, WINTERBAY DUDE GUINNESS, BU TK-PLAIN-VIEW RIPLE, WEEKSDALE JUDGES HARMONY and TC SANCHEZ KRISTINA. Congratulations to all the winners and thanks to those who participated. Who is going to show? Who has calved since Expo? Who has improved over the past three months? These are the magic questions for the 2015 Royal Winter Fair edition of the Fantasy Exhibitor. As an added bonus we have now added heifer classes to the mix. The entry deadline will be noon Thursday November 12th. There will also be a 4 point bonus for each day you submit your entries prior to that. For example, if you submitted your “string” on November 2nd you would receive a 40 point bonus. Also make sure that you don’t spend more than $1,250,000 as any exhibitor string that spends more than $1,250,000 will be removed from the competition. Winners will be announced on Tuesday November 17th, 2015. Sure you have heard of Marc-Andre Fleury the All-Star goaltender for the Pittsburgh Penguins, but just as talented is Jean-Claude Fleury from ferme Fleury in Quebec. 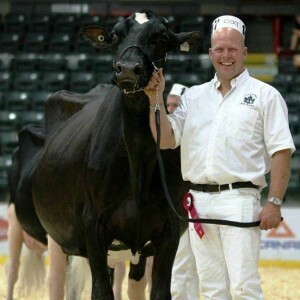 Jean-Claude is the 2015 winner of the World Dairy Fantasy Exhibitor Contest. Sure it does not come with the trophy wife or millions of dollars. But it does come with the admiration of all the over 5,000 other entries that competed in this years competition. 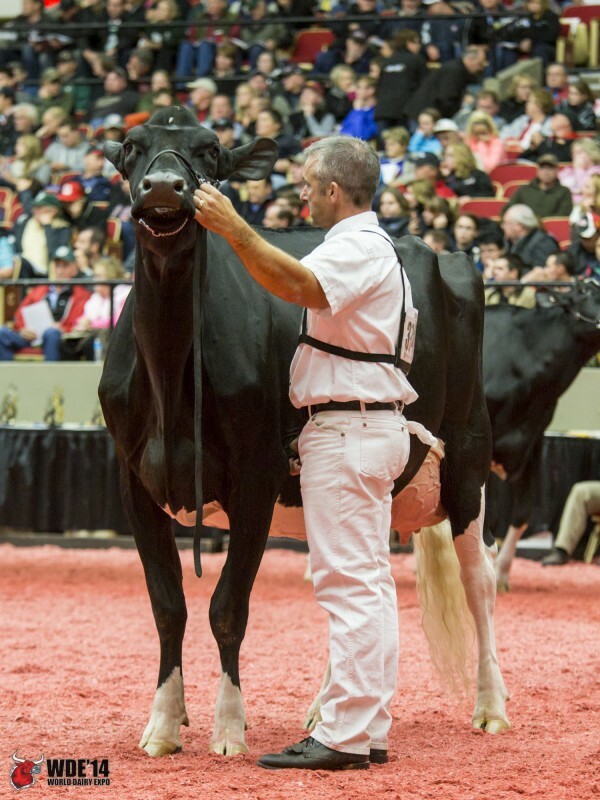 For complete World Dairy Expo 2015 International Holstein Show results, videos, pictures and interviews click here. Want to calculate your score? Here is the list of points each animal in the contest earned. Thanks to all those that participated in this year’s competition, and watch for our 2015 Royal Winter Fair Fantasy Exhibitor completion, with a few new aspects to the completion. You’ve been thinking about playing Fantasy Exhibitor© but have yet to take the plunge. Your friends have asked, and you’ve thought about it, but so far, no dice. Either you think it’s too hard or it’ll take up too much time. Look, there’s a thousand reasons why you should play Fantasy Exhibitor©. You can win prizes. You can rip on your friends after a big win. You can feel like a you are Premier Exhibitor at Expo. All of this isn’t new. But it’s only part of the reason why you should play Fantasy Exhibitor©, the ultimate reason is that it’s the fastest growing aspect of the Tanbark trail. Yes we know there are cows we will miss. And yes we know there are cows on the list that may not be at the show. We here at the Bullvine have done our best in trying to handicap each class. We have taken some cows off of the list that we have confirmed are not attending. But with so many top cows not hitting the shows already this season, it’s hard to tell who will be there and who will not. For that reason and plus the fact that we have not been to every show there is, we have limited it to 10 animals to choose from in each class. If you feel that we have underscored a cow (meaning too low a dollar value in relation to the other cows in the class), that is all the more reason to have this “great buy” in your string. Remember that you have a limited number of dollars to spend, so you are as much looking for the cows that offer the greatest value as you are trying to predict who will win the class. The entry deadline will be midnight Thursday October 1st. There will also be a 4 point bonus for each day you submit your entries prior to that. For example, if you submitted your “string” on September 21st you would receive a 40 point bonus. Also make sure that you don’t spend more than $1,000,000 as any exhibitor string that spends more than $1,000,000 will be removed from the competition. Winners will be announced on Monday October 5th, 2015.
Who is going to show? Who has calved since Expo? Who has improved over the past three months? These are the magic questions for the 2014 Royal Winter Fair edition of the Fantasy Exhibitor. As an added bonus we have now added heifer classes to the mix. The entry deadline will be noon Thursday November 13th. There will also be a 4 point bonus for each day you submit your entries prior to that. For example, if you submitted your “string” on November 3rd you would receive a 40 point bonus. Also make sure that you don’t spend more than $1,000,000 as any exhibitor string that spends more than $1,000,000 will be removed from the competition. Winners will be announced on Monday November 17th, 2014. 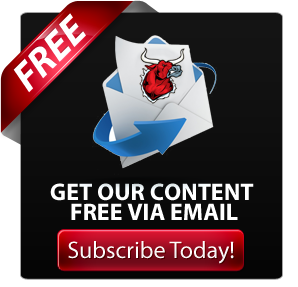 Need some help calculating your totals? 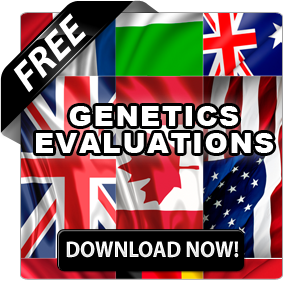 Click here to download an excel file to assist. 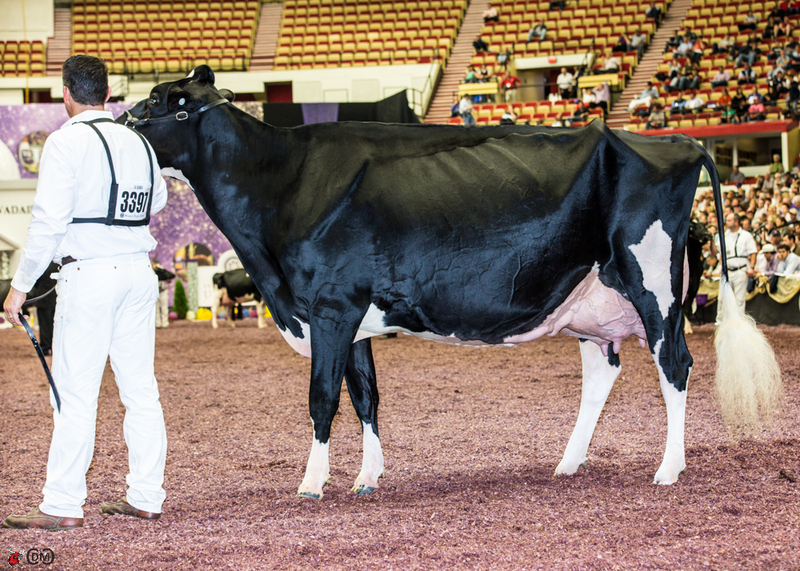 While the results from the 2014 World Dairy Expo may seem somewhat predictable with the great RF Goldwyn Hailey taking home her 2nd Grand Champion honor in the past 3 years, but that was not the case in this year’s Fantasy Exhibitor contest. 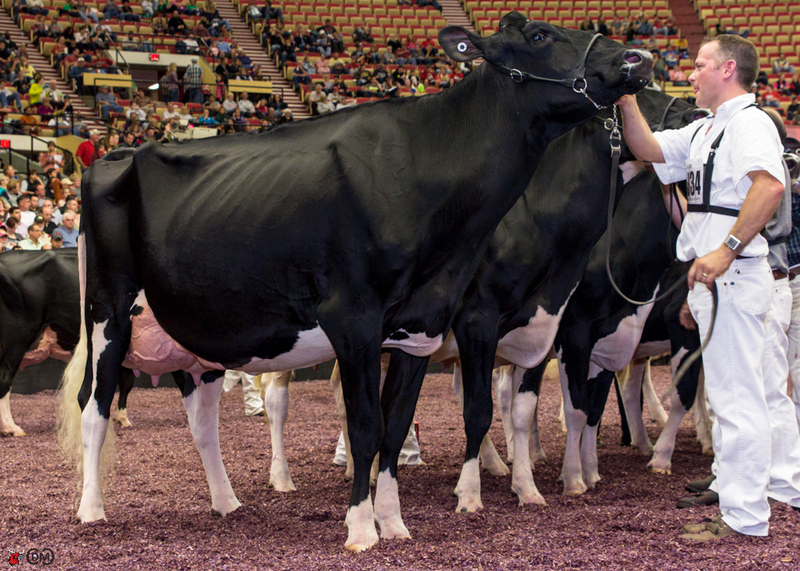 (Read more 2014 World Dairy Expo Holstein Show Results) Our sophomore year saw the number of entries grow to over 7,721 contestant submitting entries. With many entering Many entered early to receive the maximum bonus points. There where were entries from over 20 countries. A special thanks to this year’s sponsor DeLaval VMS systems. This team received a total of 141 out of a possible 170 Points. In fact this is the only team in the top 10 that did not have the Grand Champion RF Goldwyn Hailey as part of their team. Want to score your team? Here is a complete list of scores for all the animals in the competition. 1 Claynook Dawnette Hunter HUNTER x PLANET x ELEGANT 3643 Windsor-Manor Rud Zip Claynook Farms Ltd.
2 Velthuis Fernand Leola FERNAND x PLANET x SHOTTLE 3614 Lylehaven Lila Z Velthus Farms Ltd and Boldi Inc.
3 Boldi V Sudan Alecto SUDAN x MAN-O-MAN x GOLDWYN 3599 Ms Kingstead Chief Adeen-ET Velthus Farms Ltd and Boldi Inc.
4 Stantons Lexor Eva LEXOR x FREDDIE x SHOTTLE 3484 Whittier-Farms Lead Mae-ET Stanton Bros Ltd.
5 Benner Fernand Jora FERNAND x PLANET x GOLDWYN 3472 Benner Luke Jean Benner Holsteins Ltd.
6 Calbrett Brewmaster Sassy BREWMASTER x MAN-O-MAN x SHOTTLE 3454 Glen Drummond Splendor Cormdale Genetics Inc.
8 Claynook Divina Hefty HEFTY x PLANET x ELEGANT 3405 Windsor-Manor Rud Zip Claynook Farms Ltd.
9 Velthuis Supersonic Alyssa SUPERSONIC x MAN-O-MAN x GOLDWYN 3399 Ms Kingstead Chief Adeen-ET Boldi Inc.
10 Claynook Dianthus Hunter HUNTER x PLANET x ELEGANT 3395 Windsor-Manor Rud Zip Claynook Farms Ltd.
11 Leothe Epic Delpha EPIC x MAN-O-MAN x BAXTER 3385 Yvenoit Yvonne Volcan Ferme Leothe Inc.
14 Stantons Uno Enya NUMERO UNO x SUPER x SHOTTLE 3349 Whittier-Farms Lead Mae-ET Stanton Bros Ltd.
17 Stantons Epic Chloe EPIC x FREDDIE x LUCKY 3315 Sher-Est S-Wind Saturday-ET Stanton Bros Ltd.
18 Stantons Uno Eddy NUMERO UNO x OBSERVER x BOLTON 3221 Whittier-Farms Lead Mae-ET Stanton Bros Ltd.
23 Stantons Uno Eyore NUMERO UNO x OBSERVER x BOLTON 3202 Whittier-Farms Lead Mae-ET Stanton Bros Ltd.
25 Stantons Uno Erika NUMERO UNO x OBSERVER x BOLTON 3196 Whittier-Farms Lead Mae-ET Stanton Bros Ltd.
On behalf of the whole team here at the Bullvine, we want to thank each and every one of you who participated. This contest continues to outperform our wildest expectations. We will for sure be doing it again at the Royal. Due to the outstanding response we have brought back the competition that took the 2013 World Dairy Expo by storm, the inaugural Fantasy Exhibitor© contest. With 5293 entries, the inaugural Fantasy Exhibitor© competition far surpassed our expectations. The entry deadline will be midnight Thursday October 2nd. There will also be a 4 point bonus for each day you submit your entries prior to that. For example, if you submitted your “string” on September 22nd you would receive a 40 point bonus. Also make sure that you don’t spend more than $2,000,000 as any exhibitor string that spends more than $2,000,000 will be removed from the competition. Winners will be announced on Monday October 6th, 2014. It’s back! Fantasy Exhibitor brings all the excitement of Fantasy Football to the show ring. 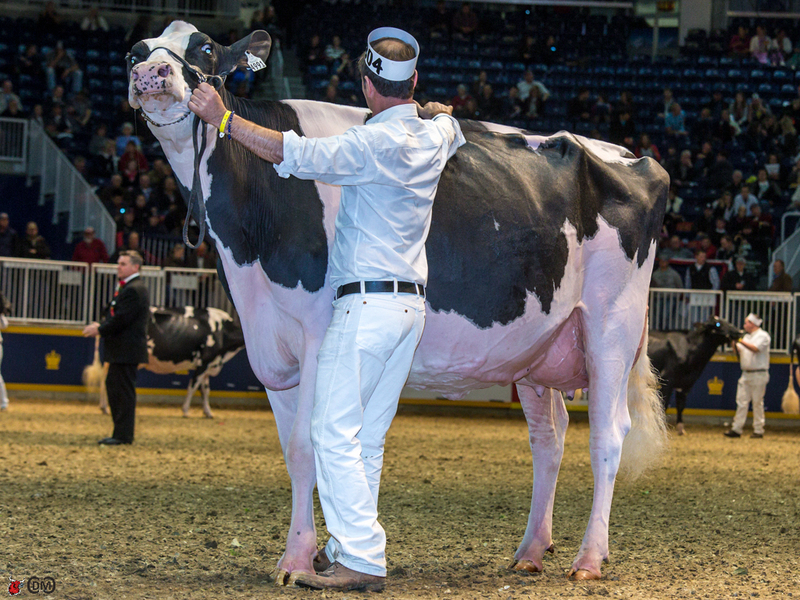 After the roaring success of the inaugural Fantasy Exhibitor competition at World Dairy Expo, the contest is back for the Royal Winter Fair. .
All cattle that placed in the top 10 at World Dairy Expo 2013 and that are expected to attend the Royal are included in our lists. There are some animals, such as the very popular Rosedale Lexington, winner of the 5 year old class, that we know will not be attending the Royal. She and others in the same situation have been left off the list. In addition, wherever possible, we have tried to include other contenders that did not attend World Dairy Expo. For example, Valleyville Rae Lynn, is on the list. The entry deadline will be midnight Wednesday November 6th. There will also be a 3 point bonus for each day you submit your entries prior to that. For example, after trick or treating on Halloween you could come home on a sugar high and feel the urge to get your picks in. That would be 6 days before the entry deadline and therefore you would receive 18 bonus points. Also make sure that you don’t spend more than $2,500,000. Any exhibitor string that spends more than $2,500,000 will be removed from the competition. 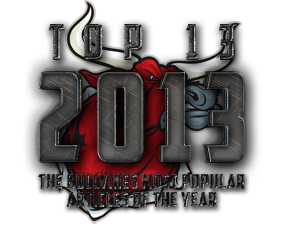 Winners will be announced on Monday November 11th, 2013. The grand prizewinner receives a one-of- a-kind Bullvine Fantasy Exhibitor Champion Jacket. All ties will be broken by date of entry. If submitted on the same day, ties will be broken by total dollars spent. 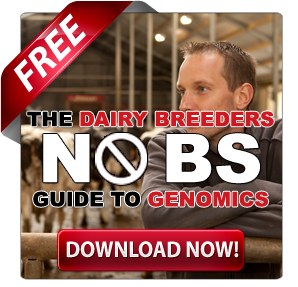 Fantasy Exhibitor – World Dairy Expo 2013 Edition – The Results! As many contestants found out you could not simply check in and pick all the favorites. You had to be on the ball to stay under the allotted $1,500,000 budget. It also took an individual who had the smarts to know what cows would be attending and showing in the Holstein Show and not the Red & White Show. 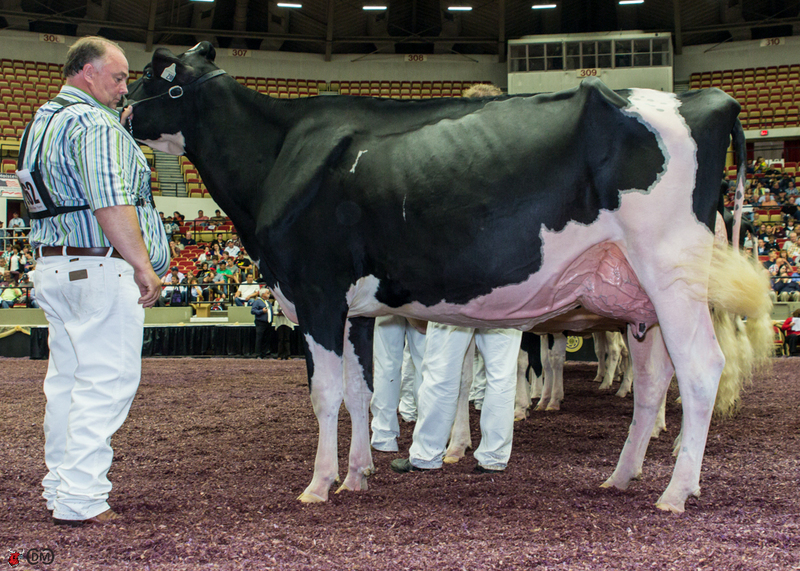 In the Junior 2 year old class one of the early favorites, Belfast Goldwyn Lasenza, proved to be well worth her pre-billing, as she earned top honors in the class and also offered the greatest value in the class. This class had many animals that had not yet shown at other shows as they may not have calved yet. It took a keen eye to know just what ones would be at Expo and which ones could stand at the top of the class. For many of the finalists it was how they placed the two 2 year old classes that determined their final ranking. With the favorites in the Senior 2 class Duckett D Layla not at the show and Claquato-RH Elicit who placed 3rd, it was those who took slight underdogs Charwill Attic Marcy and Jacobs Duplex Anna that got the greatest value for the points their choices earned. Many of the top finalists took value picks here in order to stay under budget. With the Junior 3 year old winner Ehrhardt Gold Beauty not even on our list, this class really had some interesting results. Many of the top finalists found it challenging to pick a winner in this class so most just went for a value pick. Ultimately, the greatest value in this class was Jacobs Knowledge Harpe. Although she placed 4th at the show, at $100,000 she was indeed a great value pick. 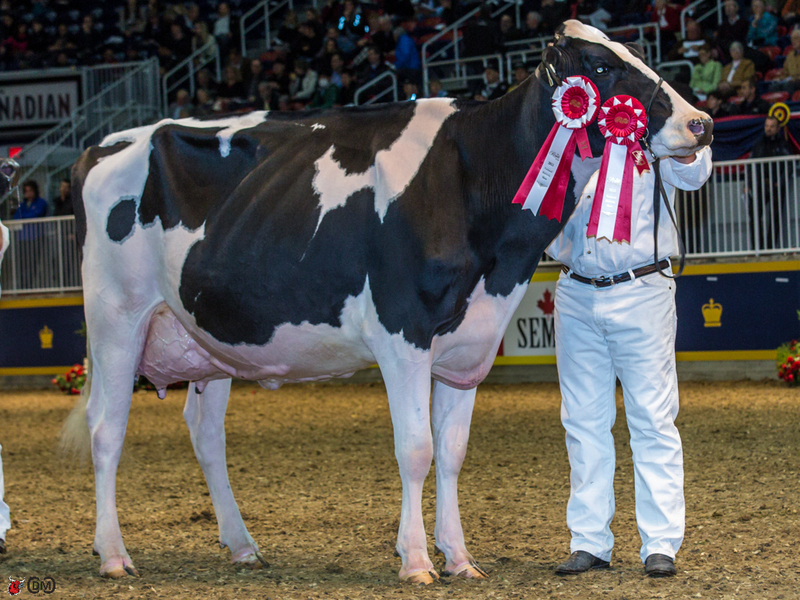 In the Senior 3 Class those that thought Butz-Butler Gold Barbara could bounce back from her defeat at the All-American show were well rewarded. While she was one the favorites coming in to Expo, her win as Intermediate Champion and the bonus points that came with that certainly made her a great value pick. 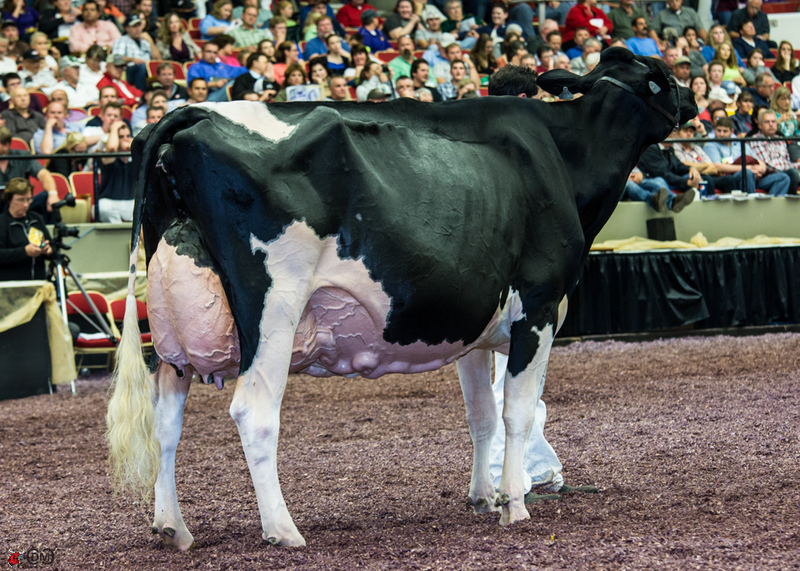 A sneakier pick that very few contestants caught was the ultimate Reserve Intermediate Champion, BKB Goldwyn Amenda who also offered one of the top 5 value picks in the whole competition. The 4-year-old class seemed to be the class that really help sorted out the winners in this contest from those that finished further down the line. While many had picked Cookview Goldwyn Monique to win, and she did, and thus also earned many extra points for being Reserve Grand Champion, it was those that went with the unbelievable value pick Robrook Goldwyn Cameron that ultimately rose to the top. At only $150,000 and earning 27 points, Cameron was the greatest value pick in the whole contest. If the 4yr year old class helped sort this out, there is no question that the 5-year-old class was a must to earn high ranking. In the end, all the top 20 contestants selected Rosedale Lexington. Even though she was not at any shows this year, the fact that there had not been any dominant 5yr old this year and with the extra promotion by her breeders, Lexington was a must pick in order to contend in the finals. 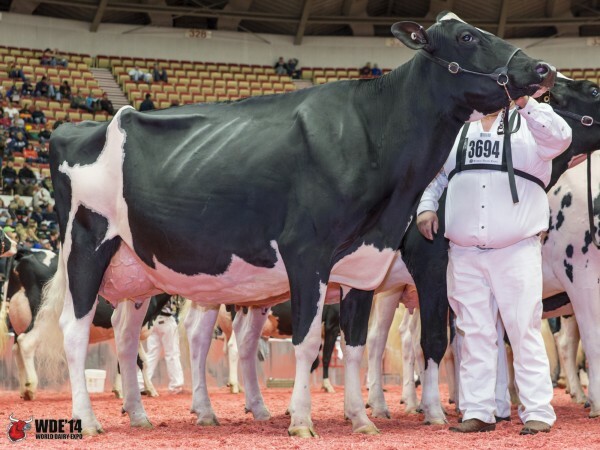 With Eastside Lewisdale Goldwyn Missy not getting on the truck to head to Madison, it was ultimately those that chose co-favorite Bonaccueil Maya Goldwyn that reaped the most reward. While Maya came with a hefty $400,000 price tag as we had picked her to win it all, the shear amount of points she earned made her a value pick. Some budget conscious exhibitors went with Whitaker Stormatic Rae and Savage-Leigh Leona who also offered some great value as they earned top points in their respective classes. It’s always easy to play armchair quarterback after the competition is over. But it is also fun to do so while the competition is still up for grabs. 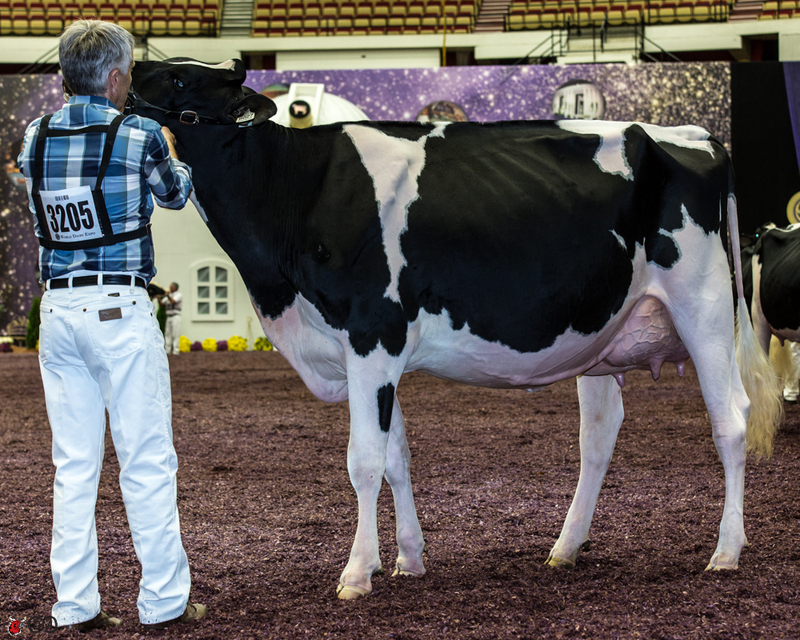 The maximum scoring team would have been, Belfast Goldwyn Lasenza, Charwill Attic Marcy, Jacobs Knowledge Harpe, Butz-Butler Gold Barbara, Robrook Goldwyn Cameron, Rosedale Lexington, and Bonaccueil Maya Goldwyn. This team would have earned an outstanding 186 points and would have come in under budget ($1,315,000). 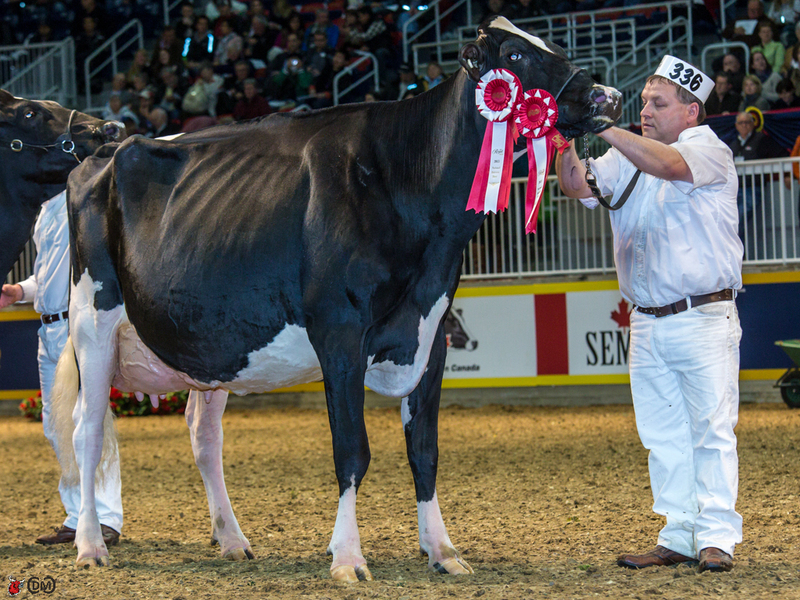 Tina Culbertson had a winning team of Belfast Goldwyn Lasenza, Claquato-RH Elicit, Roquet Jasmine Sanchez, Butz-Butler Gold Barbara, Robrook Goldwyn Cameron, Rosedale Lexington and Bonaccueil Maya Goldwyn that earned her 172 out of a possible 186 points. The following are the official values for each cow in the contest. 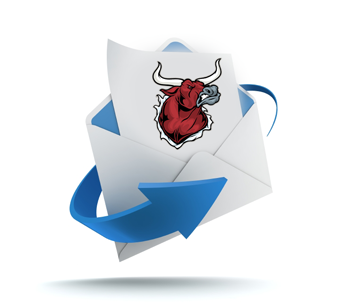 On behalf of the whole team here at the Bullvine, we want to thank each and every one of you who participated. This contest far outperformed our wildest expectations. We will for sure be doing it again at the Royal. Congratulations to our winner, Tina Culbertson!!! Everyone has heard of or participated in Fantasy Football, Baseball or Hockey games. 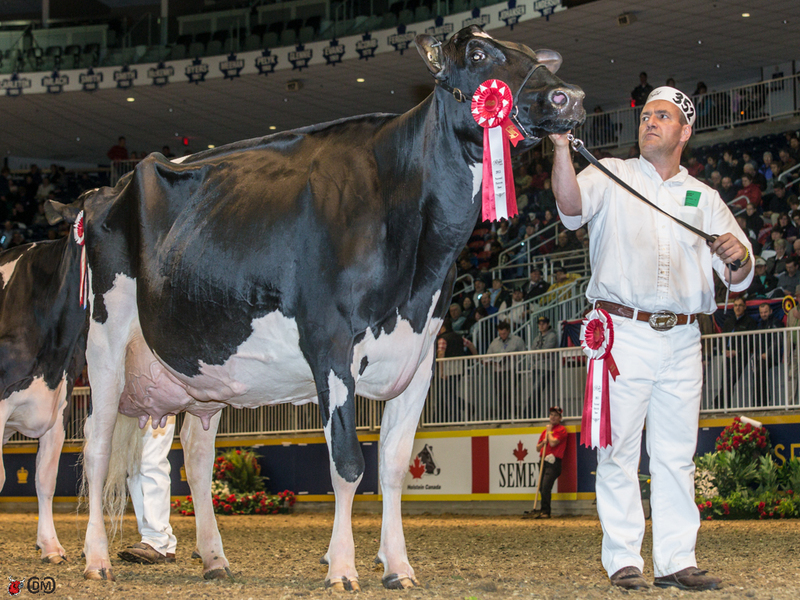 Now the Bullvine is bringing that excitement to the dairy show ring. No longer will you simply be rooting for the favorite in each class, you will also have the added thrill of watching how your team, the show string you have selected, performs. This added excitement is, no doubt, going to be the greatest thing to happen to the show ring since the introduction of Supreme Champion. The rules are pretty simple. You have $1,500,000 dollars to spend and you must pick an animal from each of our seven milking Holstein classes. 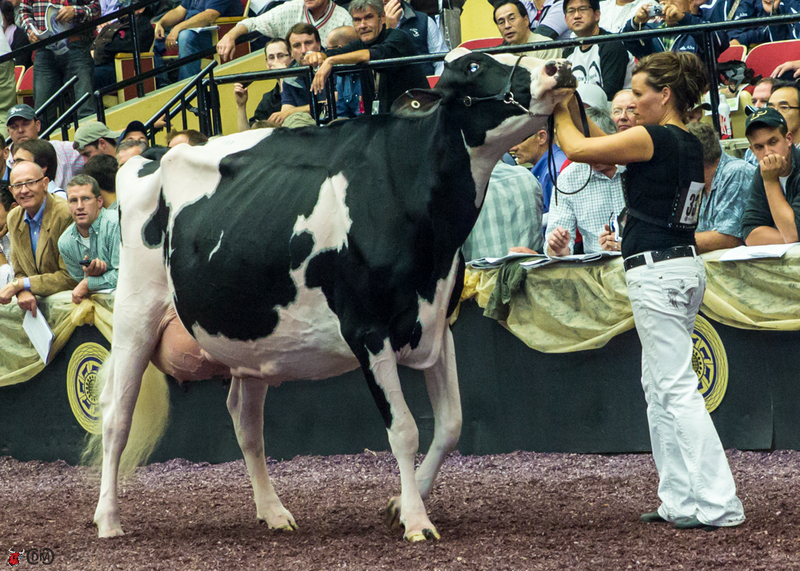 The animals in each class have been given dollar values based on their past performance and momentum heading into the 2013 World Dairy Expo. (Please note this is not an actual estimated sale price value, as this fantasy value is purely based on predicted ability to win the show in relation to others in the class). Yes we know there are cows we will miss. And yes we know there are cows on the list that may not be at the show. We here at the Bullvine have done our best in trying to handicap each class. We have taken some cows off of the list that we have confirmed are not attending. But with so many top cows not hitting the shows already this season, it’s hard to tell who will be there and who will not. For that reason and plus the fact that we have not been to every show there is, we have limited it to 12 animals to choose from in each class. If you feel that we have underscored a cow (meaning too low a dollar value in relation to the other cows in the class), that is all the more reason to have this “great buy” in your string. Remember that you have a limited number of dollars to spend, so you are as much looking for the cows that offer the greatest value as you are trying to predict who will win the class. The entry deadline will be midnight Thursday October 3rd. There will also be a 2 point bonus for each day you submit your entries prior to that. For example, if you submitted your “string” on September 23rd you would receive a 20 point bonus. Also make sure that you don’t spend more than $1,500,000 as any exhibitor string that spends more than $1,500,000 will be removed from the competition. Winners will be announced on Monday October 7th, 2013. The grand prize winner will receive a one of a kind Bullvine Fantasy Exhibitor Champion Jacket. All ties will be broken by date of entry, if submitted on the same day, tie will be broken by total dollars spent. At The Bullvine we have tired of the way most magazines cover show events. “Here is the list of the results with a few pictures.” Boring!!!! That is why we first introduced the Breeders Choice Awards (Read more: The Winners of the 2012 Breeder’s Choice Awards are… and The 2012 Breeder’s Choice Awards – The Tanbark Trail Edition) and now we are pleased to introduce our Fantasy Exhibitor Game. This is your chance to show the world your ability to pick the winners and to do it on a budget. Anyone can pick out a favorite in each class and then say that they are the best judge of cattle (Read more: (Read more: Who’s Next? World Dairy Expo 2012 Holstein Show Preview). Judges place a whole class! Great judges can pick that diamond in the rough, that one that is flying under the radar and that comes out on show day and surprises everyone!